A guide to the best cigars in the world . . .
for those with refined tastes. "Fifty" is the key word in evaluating, with the help of designated smokers, unbiased surveys and professional opinions-- which cigars are finally chosen for the year to be in this distinguished list of fifty. We were sure to include a wide range of shapes, blends, sizes and countries of origin. Personal preferences were set aside during the selection process, as reflected in the diversity of this fine international collection. 1. To be a manufacturer who has earned a reputation of excellence. 2. 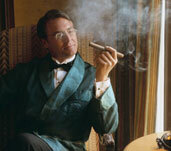 The cigar must be attractive to the eye and comfortable in the hand. 3. It must be well-constructed with the finest ingredients. 4. The experience should be savory to the senses & to the palate. 5. The product must be consistent in quality. Any cigar in this list would be a great smoke for any occasion. Seek one out, light up and enjoy. Disclaimer: This section of the website is intended for visitors 18 years of age and older. If you are not of legal smoking age, please exit by clicking here.